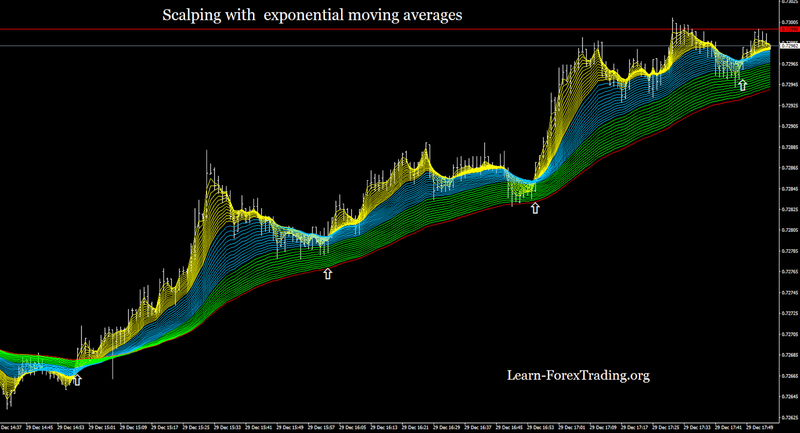 Scalping with exponential moving averages is an trend following forex strategy based on the exponential moving averages, divided into three groups, buy and sell are determined by the intersections of these groups. when the first group of EMA (Yellow) crosses upward the group of Ema's Green. Re-entry buy:when the price touches the group Ema's green or blue and returns to the group of ema's yellow. when the first group of EMA (Yellow) crosses dwnward the group of Ema's Green. Re-entry sell:when the price touches the group Ema's green or blue and returns to the group of ema's yellow. Profit Target 1 min time frame :5-7 pips when the group Ema' s yellow, breaks group Ema's Green, 4 pips in pull back. Profit Target 5 min time frame 12-20 pips when the group Ema' s yellow, breaks group Ema's Green, 7 pips in pull back. Initial Stop Loss: 18 pips. Tip:This is a trading technique very clean which however requires volatile markets. So when you apply this technique? When workers are breakout on 4 hour charts or Daily. In these situations it is likely that the volatility increases. Download template Metatrader 4 Scalping with exponential moving averages. This template can be built easily with all trading platforms.